This cookbook epitomizes my passion for both architecture and food. 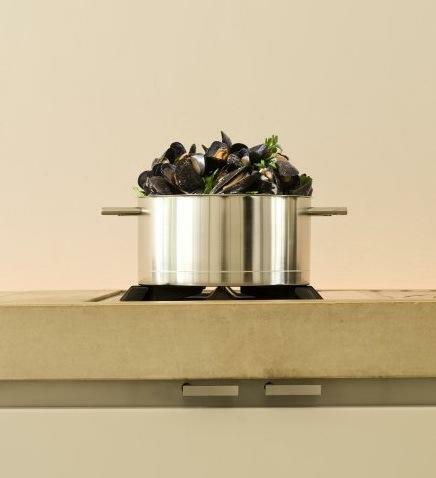 It is the collaboration between British architect John Pawson and food writer Annie Bell, which demonstrates how the philosophy of simplicity can be achieved in the rituals of cooking, eating and living. Minimalism is the idea of living simply by paring things down to their essential. With cooking, it means highlighting the individual ingredients themselves to appreciate their natural flavor and textures and pairing them with complimentary ingredients. The aim is not to eat tasteless food nor eat for the sake of eating but to learn that eating can simply be enjoyed without overpowering the actual flavor of the ingredient. Pawson and Bell also discusses the fundamentals of kitchen design, sauce pans and cutlery.